Gearing Up for 4K Production, Part 1: Connectivity, Codecs, and Capture – Vancouver Video Production Company – Shawn Lam Video Inc.
We’ll begin this 3-part series with a look at the two 4K formats and a discussion of why you’d want to shoot in 4K today even though most viewers and potential clients aren’t demanding it, and start to examine the links in the 4K live production chain with an eye to connectivity, codecs, and capture. When you’re making the transition to 4K production, choosing a 4K-capable camera or camcorder is only the beginning; you need to look at the entire workflow and assemble a toolkit of products that will work well together. You need to look at each piece of gear and locate your bottlenecks, identifying what works well and what doesn’t. From SD to HD to 4K to 8K and beyond, the entire chain of gear for live video production remains roughly the same, and the weakest link in that chain will always be your limiting factor. In this three-part series, we’ll explore discuss all the factors you need to consider as you gear up for 4K production. We’ll begin with a look at the two 4K formats and a discussion of why you’d want to shoot in 4K today even though most viewers and potential clients aren’t demanding it, and start to examine the links in the 4K live production chain with an eye to connectivity, codecs, and capture. Today we find ourselves in an era of unprecedented change when it comes to video technology. The NTSC standard was introduced in 1941 in countries that had 60-hertz electricity, and except for some minor tweaks and improvements and the introduction of color in 1953, the standard changed very little over the next 60 years. Here we are going into 2015. HD has been the broadcast standard for less than a decade, and now we’re rapidly moving into 4K. Netflix is offering 4K, YouTube says it supports 4K now, although it’s important to distinguish between the two flavors of 4K–even if Netflix and YouTube don’t. One flavor is ultra-high definition, or Ultra HD. That’s the consumer broadcast format with the 16:9 aspect ratio and the 3840×2160 resolution. We describe our HD formats as 1080p, 1080i, and 720p, referring to the horizontal resolution and whether the video is interlaced (i) or progressive (p); with UltraHD, we’ll be talking about 2160p now. 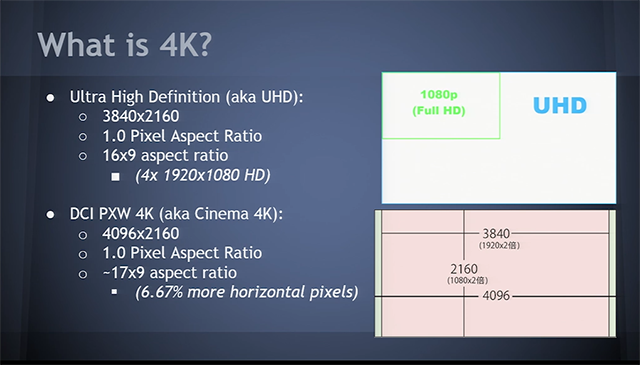 And unlike with HD, all of our pixel aspect ratios will now be 1.0, so we won’t have to worry about square and non-square pixels as we move into 4K. The other 4K format is DCI PXW 4K, also known as Cinema 4K. This format is a bit wider than UltraHD, with an aspect ratio of approximately 17:9. The distinction won’t be readily apparent to the casual viewer, but there is a distinction between the two that you need to be aware of when it comes to workflow. Some delivery media don’t support Cinema 4K. YouTube 4K isn’t Cinema 4K; it’s Ultra HD. Likewise, Netflix 4K isn’t Cinema 4K; it’s Ultra HD. If nothing else, it’s important to keep the two formats distinct in your mind to use the right lingo and communicate accurately with clients and crew.